Summer is here and it's time for the Crystal Classics team to head for one of our favourite shows of the year - the Ste. Marie aux Mines show. 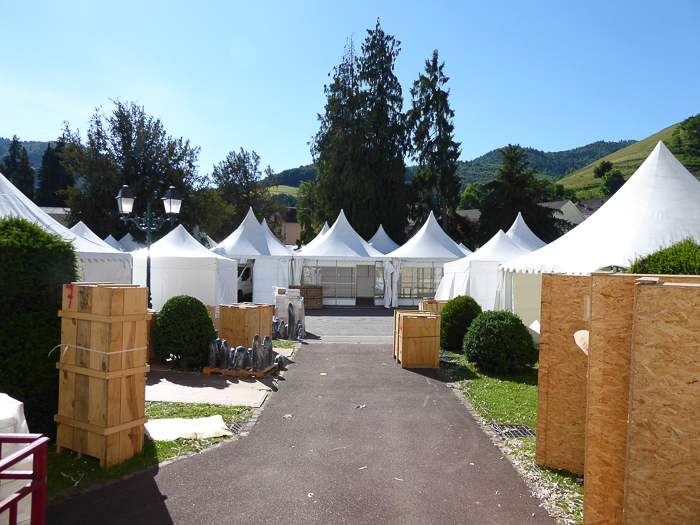 Set in the heart of the Vosges mountains just a short distance from the historic town of Ribeauvillé the town of Ste. 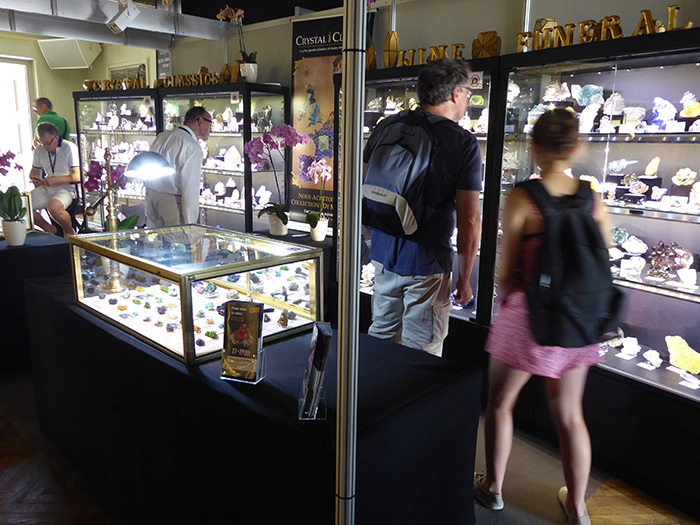 Marie comes to life at this time of year as more than a thousand dealers of minerals specimens, fossils, gemstones and jewellery all congregate for France's largest mineral show. Of course none of this happens without a great deal of effort from all of the dealers attending the exhibition, some of whom have travelled long distances to be here, not least the Crystal Classics team. on the Thursday before the event. The first of the glass showcases in position. The team working on the main show stand. Ian having a quiet moment with Allan Arnold. Peter and Katrin sorting through the first of the minerals to go into the showcases. Chris helping set up our stage booth - at the speed of light! The main show cases nearly completed. Liz Hacker tidying loose ends with Dave Hacker and Chris. The Main booth fully prepared and ready for the show. A closer look at one of the show cases filled with colourful thumbnail specimens. - Erupción Mine, Los Lamentos, Mun. de Ahumada, Chihuahua, Mexico. from Broken Hill, Yancowinna Co., New South Wales, Australia. Tourmaline is always a favourite among collectors if only for its variety of colour. This example is no exception. From Laghman Province (Nuristan), Afghanistan. and elongated black rods of Hübnerite and a little Pyrite for good measure. From the Clay Pocket, Sweet Home Mine, Mount Bross, Alma District, Park County, Colorado, USA. Malyshevo, Ekaterinburg, Sverdlovskaya Oblast', Middle Urals, Russia. Nikolaevskiy Mine, Dal'negorsk, Kavalerovo Mining District, Primorskiy Kray, Far-Eastern Region, Russia. Quilpie, Quilpie Shire, Queensland, Australia. Choix, Mun. de Choix, Sinaloa, Mexico. the Sauda Mine, Gilgit, Gilgit District, Gilgit-Baltistan, Pakistan. from San Benito County, California, USA. A cluster of interlocking Mustard coloured platey Wulfenites showing some degree of coule zoning typical of examples from this famous locality - Mežica (Miess)	Slovenia. Volodarsk-Volynskii Mines, Zhytomyr Oblast', Ukraine. from Chessy-les-Mines, Le Bois d'Oingt, Rhône, Rhône-Alpes, France. Another fine specimen from France. "Cogwheel" Bournonite crystals perched on matrix with Sphalerite. From Les Malines District, Saint-Laurent-le-Minier, Gard, Languedoc-Roussillon, France. Hope's Nose, Torquay, Devon, England. Samson Mine, St. Andreasberg, Harz, Lower Saxony, Germany. Fedenstock, Felli Valley, Reuss Valley, Uri, Switzerland. Špania Dolina (Herrengrund), Banská Bystrica County, Slovakia. Another Czech Classic - Acanthite with Stephanite, Pyrite and Calcite. Mörchnerkar, Mörchner Area, Zemmgrund, Zillertal, , North Tyrol, Austria. with a few tiny Goyazite crystals in association. Hafner Group, Hohe Tauern, Carinthia, Austria. Hot work as some of the out side dealers prepare for the show in temperatures up to 35 degrees. An Amethyst dealer sets out the Geodes for display. Chris examining some of the Quartz artefacts in one of the tent lined streets. Ste. Marie is not always just minerals, fossils and Gemstones. Sometimes other items of interest creep into the show! One of the may Wholesale mineral stands with a variety of colourful worldwide mineral specimens. Every inch of indoor space is used in Ste Marie even the local swimming pool. Here, Chris examines one of the well lit specimens put on display there - a large pink Fluorite from the Alps. on display at the Ausrox booth. Hunan Province, China at the Cristalli stand. from Huayllapon Mine, Pasto Bueno, Pampas District, Pallasca Province, Ancash Department, Peru. Luis Burillo, as always had a great selection of mineral specimens to show. the Ojuela Mine, Mapimí, Durango, Mexico. Las Manforas Mine, Camaleño, Cantabria, Spain. Books... just one stand in the theatre devoted to reference literature for collectors. The Lapis magazine stand run by Tobias Weise. Liz and Dave Hacker enjoying the show. Liz with locals dressed in traditional mining costume. Martin Stevko arrived on Saturday to help. Each year at Ste. marie Debbie has a birthday and as always a cake was in order. Ian and Diana cut into small pieces so no one misses out! That's the end of another very warm visit to Ste. Marie. so we hope to see all our mineral friends there.